When I posted a photo on Facebook of an empty toilet paper holder and a new roll set on the counter, I received a lot of comments. 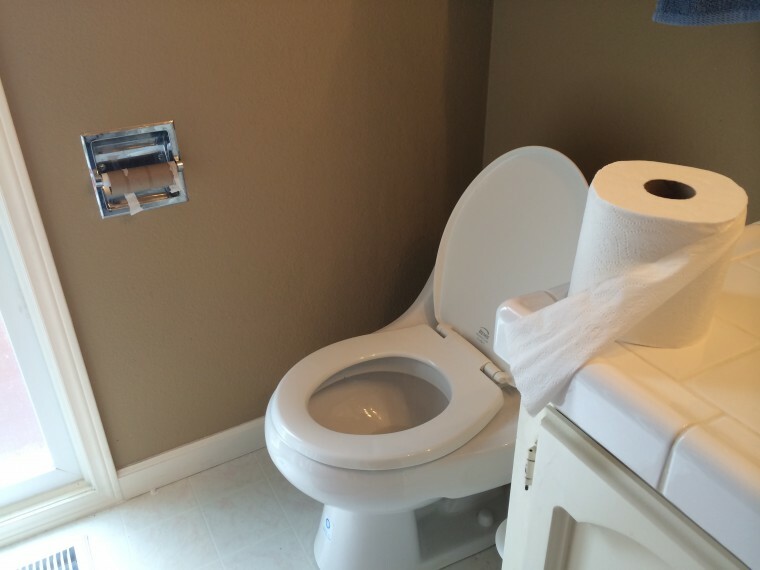 What surprised me was how many people defended setting the toilet paper on the counter rather than taking 10 seconds to put it on the holder. It’s a small thing, you might say. But when multiplied throughout the day, these small things add up to cluttered focus and poor productivity. The toilet paper incident brought to mind a professional coaching competency: Do it now. David Allen, the author of the popular book Getting Things Done: The Art of Stress-Free Productivity, maintains that any task or email that can be done in under 2 minutes should be done immediately. Other tasks should be delegated, scheduled, or eliminated. I can forget about it. Completing a small task takes it off my list. I don’t need to revisit it or worry about doing it later. The Devil is in the details. Completing small tasks and replying to emails helps me stay up on the details which end up magnifying into huge wins in the larger picture. NOT staying up on the details can produce huge losses. It focuses me. Completing small tasks immediately, like straightening up my desk and depositing a check, make me feel good. I am more organized, less cluttered, and more focused. Using the 2-minute Do It Now rule at work can enable you to get more done with much more satisfying results. Use Do It Now during meetings, during coaching conversations, as you work. Remember, each time you have to touch something – an email, something on your desk, your in-box, your calendar – costs you time. More importantly, it costs you focus. Telephone the person, rather than texting or emailing. Coach a subordinate for a few minutes, if you still need more time, schedule it. Reply to emails that take less than 2 minutes. If the decision is all but made, make it. Give feedback as you see it, rather than later. Take a break, take a walk, and stretch. Write your notes and action points from a discussion as you talk, rather than afterwards. Write down the idea, rather than trying to remember it. Calendar the appointment now, rather than emailing back and forth later. Have that challenging conversation now, rather than waiting for the “right” time and having it hang over you. I used to put off doing the little things around my home. One day I realized that the organized life I imagined having someday was never going to get here unless I changed and began to do things now. I wrote about that here. “I’m gunna do it later…” is a the mantra of busy people. A few months ago, I banned the word ‘gunna’ in my home. “No more gunna!” I said. “Do it now. Get it done. Later is now!” — I was on a roll. Change the toilet paper roll. And, yes, with the paper over the top. Put your clothes in the clothes hamper. Call your mother, a friend, your kids, when you think of them. I want you to succeed in what is important to you. And I know that the undone, gunna-do-it, I’ll-get-around-to-it things are getting in the way of your focus and productivity. I challenge you to Do It Now for 48 hours. That’s just 2 days. Anything that can be done in less than 2 minutes do now. Are you willing? At the end of 48 hours, think about how you feel. Consider your focus, your mindset, and your sense of organization. If you see positive results, then keep going! Question: Share your experiences with Do It Now. You can leave a comment by clicking here.